Preheat the oven to 170°C, gas mark 3. Grease a 20cm loose-bottomed cake tin and line the base with baking parchment. Place the butter and chocolate in a bowl over a pan of simmering water and stir until smooth and glossy. Remove from the heat. Stir the egg yolks into the chocolate mixture. Add the ground almonds and muscovado sugar and stir lightly until evenly mixed. Using an electric whisk, beat the egg whites for 3-4 minutes, or until stiff peaks form. Fold a quarter into the chocolate mixture. When evenly mixed, fold in another quarter, then fold in the remaining egg white. Turn into the prepared tin and shake the tin gently to level the mixture. Bake for 30-35 minutes, or until firm to the touch. Leave in the tin to cool. Meanwhile, place the chopped apricots in a small pan with the orange juice. Bring to the boil, then simmer, covered, for 10 minutes, or until the apricots are tender. Leave to cool, then fold the chopped apricots a spoonful at a time into the crème fraîche. Remove the cake from the tin and place on a serving platter. Dust the top with cocoa powder and icing sugar. Serve cut into wedges with the apricot cream. For an elegant, striped finish to your torte, cut strips of baking parchment about 2cm wide and arrange over the top of the cake 2cm apart. 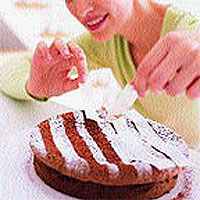 Dust with icing sugar, then carefully remove the paper strips. You can make this cake up to two days before serving. Cover with foil and store it in its tin in the fridge. For a smoother apricot cream, purée the apricots in a blender until smooth. You can use whipped cream instead of crème fraîche, but make sure you add the purée to the cream, not the other way round, or you will knock the air out of it.